Manley Pointer, who led the ostentation of peacocks at Flannery O’Connor’s Andalusia Farm, has left this mortal coil. The brilliant Kay Powell, longtime mistress of the Atlanta Journal-Constitution’s obit desk, pays tribute. Ah, the magnificent peacock — symbol of immortality and resurrection, guardian of the Gates of Paradise, screecher at Flannery O’Connor’s Andalusia Farm. Andalusia’s peacock Manley Pointer was not immortal and is not resurrected. He died during January’s arctic blast. He lies a-mouldering in his grave off Andalusia Farm’s nature path. The Greeks dedicated the peacock to Juno believing its tail of golden circles on a blue background honored the goddess of sky and stars. Early Christians thought the peacock’s blood could dispel evil spirits. Mythology embodies its tail feathers as the evil eye. In dreams, the peacock symbolizes new birth, confidence, even arrogance. O’Connor’s party of peafowl — she stopped counting at 40 — is gone. The tradition of Andalusia Farm’s peacocks, arguably literature’s most famous bird, was restored in 2009 by a donation from Col. Charles Ennis of Milledgeville. A public poll named the peacock Manley Pointer after a great O’Connor villain, the wooden leg-stealing, faux Bible salesman con artist in “Good Country People.” Bruce Gentry, editor of the Flannery O’Connor Review, prefers that the peacock had been named for a more appropriate O’Connor character in “Parker’s Back,” the tattooed Obadiah Elihue Parker, a hard-drinking, woman-chasing heathen who sort of turns into a peacock at the end of the story and receives salvation in the garden of Eden. Manley Pointer, when he was still among us. Photo courtesy of the Milledgeville Convention & Visitors Bureau. Manley Pointer’s heritage is embodied in mythology, religion and dream interpretation. Yet he was a thoroughly modern bird given to twerking during mating season and ending his life celebrated through 21st century social media. Manley Pointer, 6, died Jan. 8, the victim of overnight 18-degree weather despite extra warming measures taken in his aviary. He died in the arms of his caregiver, April Moon Carlson. News of his death drew 8,000 views on social media. A coterie of young mourners met through social media, dressed in black, and attended the sunset funeral at Andalusia Farm. 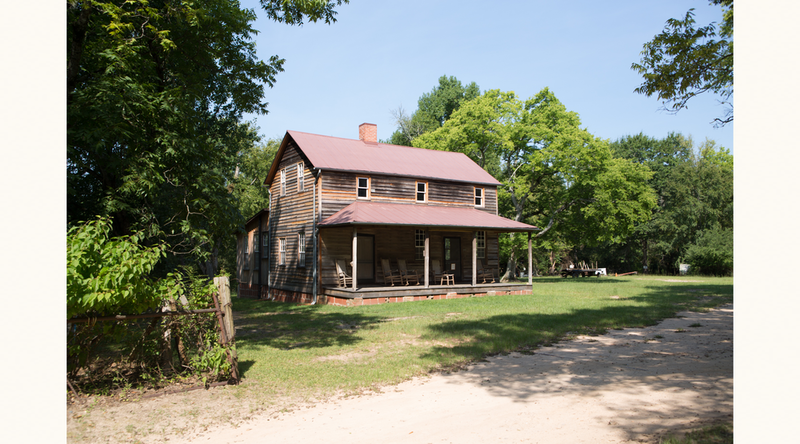 Flannery O'Connor's home outside Milledgeville, Ga., Andalusia Farm, came into her family when it was purchased in the early 1930s by her uncle, Bernard Cline. About 20 mourners proceeded to the gravesite singing “I’ll Fly Away” led by Daniel Wilkinson, a choir director and O’Connor graduate student at Georgia College and State University. He noted that day was his very first as a church choir director and already he was officiating at a peacock’s funeral. At the grave, off the nature trail and marked by a cross of cedar branches, GCSU theater professor Amy Pinney read from The Habit of Being, choosing O’Connor’s admonition to author Cecil Dawkins, which includes: “You are asking that man return at once to the state God created him in. You are leaving out the terrible radical human pride that causes death.” O’Connor’s belief in “the terrible radical human pride” is thematic in her writing, and her peacocks are symbolic of pride. She uses the peacock when she wants to make a specific point about a character. Wilkinson read from “King of the Birds.” He selected the passage about an old man who came to Andalusia to buy a calf and had with him five or six white-haired, barefooted children who were stopped dead in their tracks when they saw a peacock. “Whut is that thang?” one of the boys asked. Andalusia Farm, scenes from which are included in this gallery, is now on the National Register of Historic Places and is open for visits. Manley Pointer did not disappoint. Frequently photographed by visitors to Andalusia Farm, now a museum four miles north of Milledgeville, his majestic tail feathers proudly arched during mating season or formed an impressive iridescent train when at rest. Tail feathers shed after his last mating season were collected into a huge bouquet. A freshly washed feather was presented to each mourner, and one was laid on his grave. Andalusia Farm executive director Elizabeth Wylie’s son Spencer Cheek has collected clay from the farm to create a permanent grave marker. And how would O’Connor react to Manley’s death and funeral and the ensuing outpouring of mourning and adoration? Sharing Manley Pointer’s tail feathers with mourners is very much in the Flannery O’Connor tradition. She gave the feathers to the ladies of Milledgeville to decorate their hats and enclosed peacock tail feathers in her correspondence. Most were received with appreciation. Not so by O’Connor’s great champion the poet Robert Lowell. After one of his manic spells, O’Connor sent him a five-foot tail feather. Lowell’s comment? The peafowl live in the aviary to protect them from predators. O’Connor’s peafowl had free range at Andalusia. They created crater-sized dusting holes all over the farm, ate its fruits, vegetables, peanuts and flowers. After O’Connor’s death in 1969, The Color Purple author Alice Walker, who grew up in Eatonton near Andalusia, visited the farm with her mother, Minnie Lou, and wrote about their pilgrimage. O’Connor writes of a telephone company lineman who came to the farm, completed repairs and lolled around trying to coax a peacock to fan out his tail. The lineman trailed after the peacock for 15 minutes or so, then got into his truck and started off. The bird shook himself and his tail rose around him. “Well, what do you think of that?” she asked.